Back in February, McDonald’s announced that by 2020, at least half of its Happy Meals offered around the world would come in under 600 calories, with only 10 percent of those calories coming from fat. (That’s already true of all U.S. Happy Meals.) The move led the chain to nix cheeseburgers from its Happy Meals, reduce the size of its french fry servings, and retool its chocolate milk recipe. In yet another health-conscious improvement, McDonald’s will now offer bottled water as a Happy Meal beverage option for no additional charge. McDonald’s announced yesterday the 16.9-ounce Dasani water will no longer cost parents extra. This is a weird McDonald’s quirk: If you order a breakfast sandwich combo, for example, you’ll pay extra if you want a bottled water instead of a coffee. 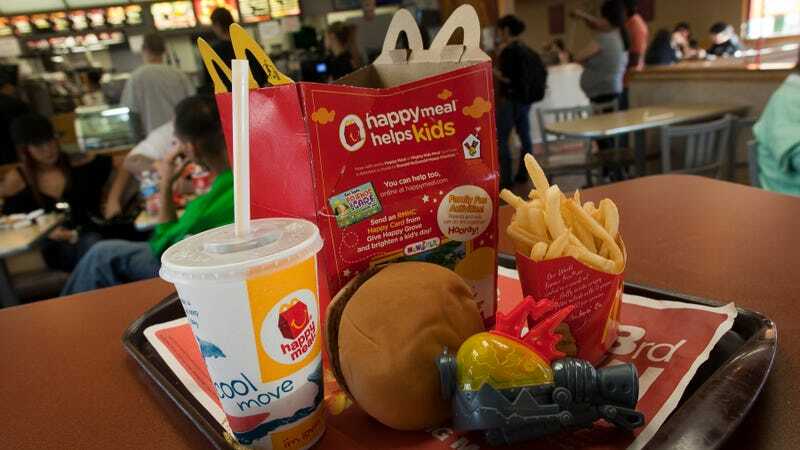 In another Happy Meal tweak, the company also has removed artificial preservatives from the strawberry Go-Gurt yogurt available as a Happy Meal side. (This artificial preservative-free version is exclusive to McDonald’s.) Artificial colors, preservatives, and flavors got the boot from McDonald’s standard line-up of burgers in September. These small changes aim to make kids’ fast-food meals just a little healthier without changing them so drastically that they’d lose their appeal. Kids can now choose from apple slices or yogurt as a side, and from water, apple juice, or low-fat milk as a beverage. But as my colleague Gwen Ihnat pointed out in her piece about the cheeseburger-less Happy Meals, are parents really visiting the drive-thru lane in search of healthy kids’ food? If the company keeps moving in this direction, they might.